I was an equal part of the research and idea generation phase, documenting user interviews and analysing the information collected. I played an integral part in storytelling and video prototyping for the project. I worked along side our product designers drawing out the wireframes for the screen interface. I led the scripting, filming and editing of the videos and scenarios. Design and develop a system and interface proposal that reduces the attention required for anaesthesiologists to run and supervise the system so that more focus can be directed towards the patient and communication with colleagues. One challenge the Anaesthesia nurse encounters today is the drug injection process on the patient: Depending on the patient's reactions to various variables, including patient's reactions to sleep-inducing drugs and surgery on inner organs, the Anaesthesia nurse must counteract them in order to keep the patient stable and unconscious. Yet, sometimes it is quite difficult to estimate the right amount of for the counteraction, and thus potentially harming the patient through injecting the wrong drug dose. The Sandbox concept allows the nurse to learn and explore different alternative parameters of the Anaesthesia drugs and their effects on the patient before executing scaled changes. When the nurse adjusts the parameters, the patient’s values will be displayed as they are getting affected. In this way the nurse can have a safe learning environment to explore and fail in the system, without harming the patient. This allows the Anaesthesia nurse to use the autopilot phase more efficiently, by for example preparing the landing phase in advance. Introduction seminar about Anaesthesia machines. 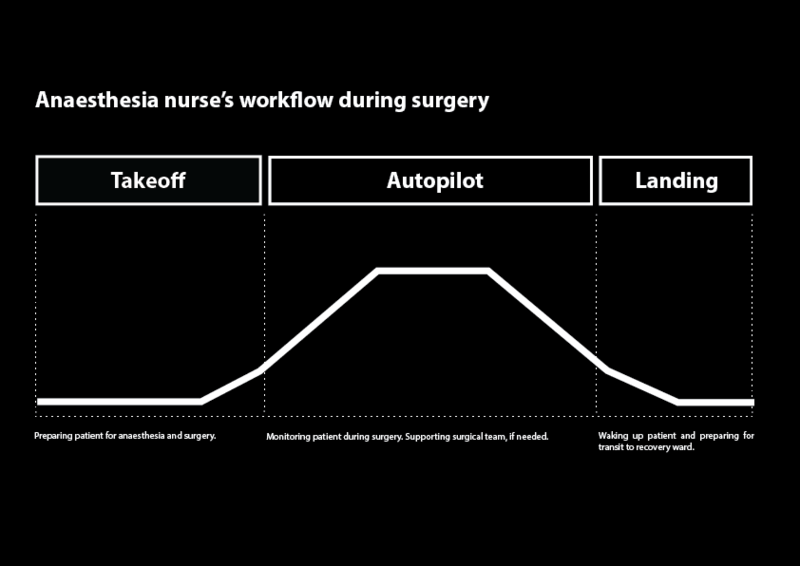 The autopilot phase is usually the less active part of an Anaesthesia nurse during surgery. Most of their work happens during the take off and landing phase. The nurses need to double check their readings against two sources, the patient, and values and numbers from the master screen. With our knowledge from research, interviews and hospital visits we structured and grouped our findings in order to search for patterns, problem areas and possibilities to get a starting point from where we could turn our insights into tangible ideas. Together with our collaboration partner, colleagues, and tutors, we hosted and participated in a wide range of activities revolving around our research findings. The purpose of this engagement was to speculate and imagine scenarios of how the operation theatre of the future might look like. Hypothesising about possible future scenarios with Lego. During our design sprint, we focused on specific keywords that were abstracted from the research workshop, for example empathy and human touch. We were interested in skilling up the nurse’s human sensory apparatus as it might offer a different way of learning on how to monitor the Anaesthesia that is induced to the patient. Technology is not what makes good patient care, rather it is empathy and the confidence of one’s human abilities. To us, good interactive products respect all of man’s skills: his cognitive, perceptual- motor and emotional skills. Initial concepts – Second skin: We developed the wearable device “second skin”, which is an elastic, breathable display that fits on the skin and measures the patient’s vital signs and transmits the biometric data wirelessly to the master screen. Initial concepts – Layered touch: Another concept is the faceless gestural interaction “layered touch”, which enables the Anaesthesia nurse to apply Anaesthesia machine settings on the patient through gestural interactions. 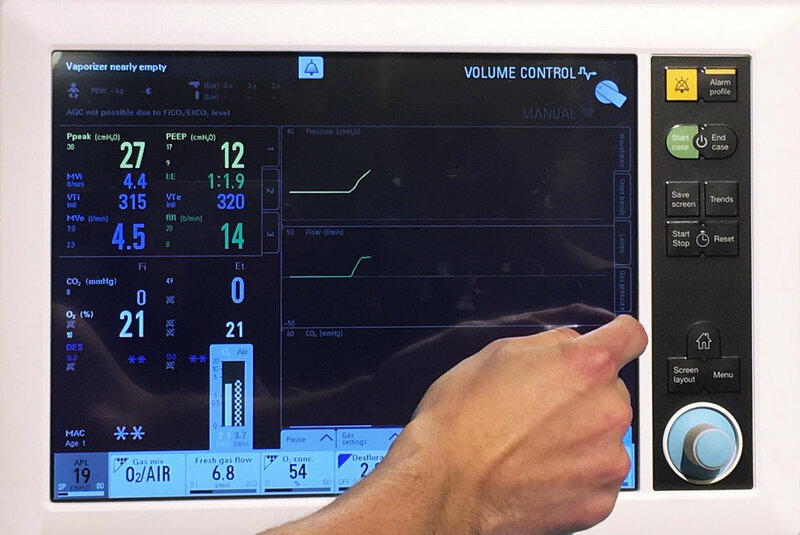 Initial concepts – Checkpoint touch: In case of an signalled alarm emergency coming from the master screen, the Anaesthesia is suppose to stabilise the situation through touching the patient. Playing out various surgery scenarios with an Anaesthesia nurse helped us to understand the user's emotional level in surgery. We learned that the process of dehumanising patients into their body parts is a necessity for medical caregivers to regulate negative emotional responses. This is especially important in situations when they feel the pressure to deliver highly efficient and effective care. In workshops with an associate professor, we role played together possible scenarios of how the operation theatre of the future might look like, and also explored on how nurses would interact and use our prototypes in different situations. We learned a better understanding of what empathy and human touch means in association with the nurse’s daily work routine. 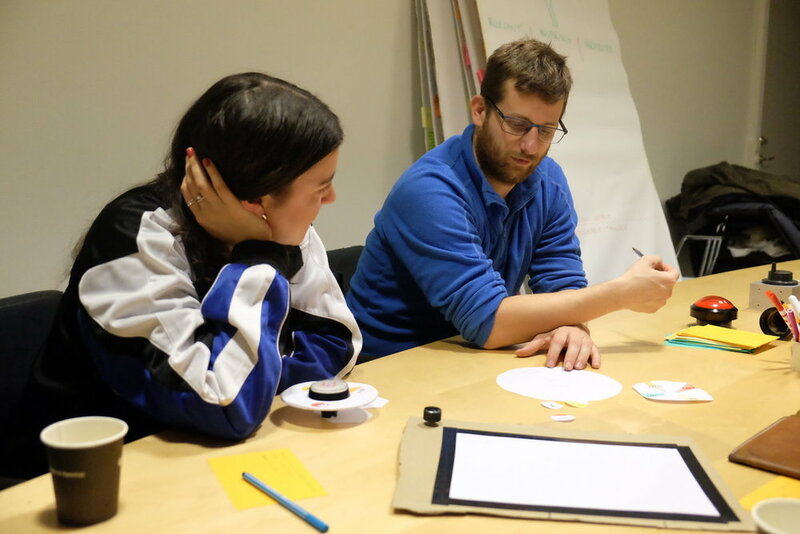 The human touch concept proved in this user testing to be difficult to implement with the human-centered-design approach, as there are practical reasons for the lack of human touch. Role playing with a puppet theatre set. Exploring possible scenarios with a nurse teacher. Drawing out together an emotional journey of an Anaesthesia nurse during surgery. Clustering concepts with the Design Representation Forcefield. Going back to the knob: During our research process we understood the crucial role of the knob of the current Anaesthesia machines, from which navigations, settings and confirmations are made. With this knowledge as the new starting point we saw the potential in translating the expression of the knob into our final concept. The tactile feeling of precision: The cylindrical form of the product, combined with its outer rotary ring, draws inspiration from many other sources. It alludes to the aperture of a camera lens, linked to zooming in or out on a parameter or a value. 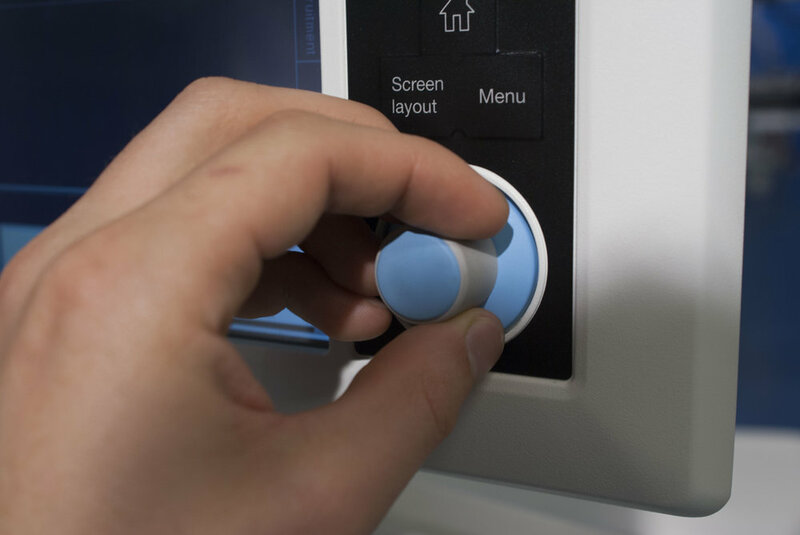 It´s important for the nurses to feel precision while adjusting the parameters, which they today have the possibility to do through the already existing knob on the master screen. This was a reason for us to both add tactile resistance and sound feedback in the rotating outer edge of the product. To visualise our ideas of the final concept we created simple prototype variations with cardboard and paper, to facilitate testing different interactions, sizes and colours. For a more clear link between the readings on the existing master screen and our final concept, we adopted the master screen's visual identity on our concept as well, with the intention to ensure a comparison between the simulated (our concept) and live patient data (master screen). Building the sandbox's information architecture: When deciding what information to include in our interface, we used the analysed screen from our research material. In dialogue with nurses we developed together the information architecture of the final concept; what patient values should be included in the product and how do we structure these values hierarchically. We tested the product with both nurses and other students at the university. Some of the results indicated that color contrasts among the values made it easier to read the interface. In addition, subjects mentioned the importance of understanding the disposition of the values displayed on the device and how to read the span of target values, current value and how the value is affected while adjusting the parameters. Testing interactions with sandbox: We tested different interactions with focus on the tactile feeling of precision. It was important for us to make the product easy to navigate in between the different values and parameters, as well as holding the device comfortably in your hand at the same time. Critical actions have been designed as modes. We video prototyped a specific user scenario within a self-built hospital environmental setting. Furthermore, we decided to show the final interface product via screen replacement effects. Thus, this required from the team to do track motion on a rounded shape object as well as masking moving bodies in Adobe After Affects – one of the most technical challenging tasks in this project. Since the green screen replacement did not work well in the post-production, we decided to re-shoot again – but this time in a real hospital.